A spokesperson for the West Papua National Committee (KNPB) has claimed that the detention of a number of KNPB activists and the addition of more KNPB members’ names to the Wanted Persons List has been done purely in the interests of the Papuan political elite. Photo caption: Wim Medlama (in blue hat) with Hakim Pahabol, West Papua National Parliament member, and KNPB members during their press conference. KNPB stated that the political elite, along with the Regional Police Chief, are trying to place the blame activists and the broader Papuan community [for the lack of democracy]. “Papuan police are suppressing democracy in order to favour the Papuan political elite. 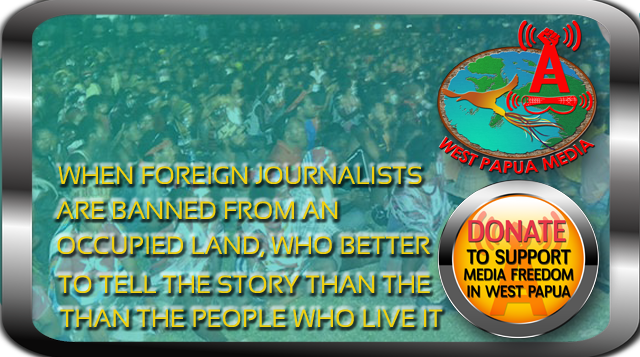 It is in the elite’s interest that the people of Papua are being victimised. Many members of society and of KNPB have had their names added to the Wanted Persons List,” KNPB’s spokesperson Wid Medlama said during a press conference on Saturday (5/1), at the Cafe Prima Garden, Abepura, Jayapura, Papua. KNPB are urging the Regional Police Chief to free a number of KNPB activists and remove their names from the Wanted Persons List. “Clear the names of all KNPB members and activists from the wanted list, and free those detained without clear evidence,” Wim said. According to the KNPB, the people of Papua wish to have the freedom to fulfil their aspirations and to go about their lives without anyone having to suffer. Space for the people to express themselves collectively must be made available by the government. Without this space, the government cannot talk about a ‘democratic country’ or a ‘democratic society’. “A democratic space is needed for the people of Papua. Without it, there is no point in [calling ourselves] a democratic nation. What is the meaning of becoming a democratic nation if there is no democracy for the people?” added Hakim Pahabol, a member of the West Papua National Parliament. On 2 December. members of the National Committee of West Papua (KNPB) were still seeking information regarding the whereabouts of their chairman, Victor Yeimo who was released by the police after being interrogated in connection with the demonstration organised by the KNPB on 1 December.Yeimo was arrested on 1 December but then released on Saturday afternoon, but since then he has not been in contact with other KNPB activists. ‘Today, after he was taken into custody by the police in Abepura he was released because we were unable to continue with the questioning,’ a police spokesman told JUBI, when inquiries were made about the status of Yeimo and two others who had been arrested with him. Although they have been released, the spokesman of KNPB, Wim Medlama said that they have been looking for them but have not been able to find them. He said that they have decided to go to the police in the morning to inquire about this. He also said that they would go to the police in the morning together with the WPNA, AMP and AMPTI. According to information received obtained by JUBI from other sources, Yeimo had separated from the other activists in front of the Post Office in Abepura. Since then, they have not been able to find out anything about his whereabouts. When JUBI tried to contact Yeimo on his mobile, the phone was not active. However, early Monday morning, Jubi journalist and editor Victor Mambor reported that he had confirmed that Victor Yeimo was already gathered with colleagues. “Last night, I got an SMS from Mr. Waterpauw (Wakapolda) who says Victor Yeimo was been contacted by Alfred Papare (Kapolresta) on Sunday afternoon (02/11). Victor Yeimo is fine and he switched off his mobile phone for personal reasons. This morning, I got (an) sms from KNPB members who said Victor Yeimo already (was) gathered with them,” Mambor wrote in an email alert. West Papua Media has attempted to independently contact Papuan police, but no reply has been forthcoming if Yeimo is under charge at the moment, nor to questions of Mr Yeimo’s treatment whilst in the hands of the police. It is not known if Yeimo has been able to contact human rights lawyers. Written and verbal questions to Jayapura police to determine Detachment 88 counter-terror unit involvement in his interrogation have also gone unanswered, as have questions as to why Yeimo was released while he is on a Wanted (Daftar Pencarian Orang or DPO) list, allegedly for subversion, and unfounded charges of his alleged involvement in “unknown persons” (Orang Terlatih Khusus) shootings – widely believed by Papuans to be the work of Indonesian special forces. West Papua Media has documented several cases since the assassination of Mako Tabuni by Detachment 88 troops in June, of scores of highland Papuans who have been brutally mistreated by security forces in the hunt for Yeimo, who has been in hiding for most of this time.